It's time to go further than pho. Naturally, the first thing you’ll find yourself doing when you arrive in Vietnam’s Ho Chi Minh City (or Saigon, as it is still known to locals) is gorging yourself on pho. The broth is popular globally for its perfectly balanced depth of sweetness and saltiness, filled out with aromatic herbs, braised meat and your choice of fresh and bottled toppings. But while pho could easily nourish you for every meal, it’s wise to open up your eyes (and stomachs) to the endless options of amazing street food in Vietnam. Generally, there is only one rule that you should abide by when it comes to eating street food. As long as you can see them preparing and cooking it, then it’s all good. Here’s some of the lesser-known dishes you should be wrapping your mouth around. RELATED: HOW TO EAT LIKE A LOCAL IN VIETNAM. These tiny parcels of grilled beef are a treat with a glass of beer. Beef is minced and mixed in with a variety of spices and wrapped in betal leaf. By themselves, the leaves are quite plain, but when grilled on the barbecue they impart a smokey note that perfectly compliments the meat. They usually come served alongside a platter of vermicelli noodles, herbs, lettuce, slithers of pickled carrots and starfruit. You can eat them as they are but the proper way is to grab some rice paper to encase everything into a roll and then gobble it all down in a few bites. Closely resembling a folded omelette, this wafer-thin package is comprised of rice flour batter and laced with turmeric to impart a yellow tint. A variety of stuffings can be included but the best one is the standard pork belly and fried prawn combination along with sautéed bean sprouts. The perfect Banh Xeo should be wafter thin, crispy and not oily. A big plate of herbs and salad will be served with it which is to be considered a part of the dish rather than just a garnish. To eat it, cut off a segment from the pancake and wrap it inside a lettuce leaf along with the basil, parilla leaves and mint and dip it into a nuoc mam (sweet fish style) dipping sauce. There’s no elegant way of eating it but who needs to look good when something tastes as good as this? Pho is incredible and it’s a dish that has single handedly introduced millions of people to the Vietnamese cuisine. But what you’ll come to realise when eating in Saigon is that there are oodles of noodle dishes out there to choose from. You can have a different noodle dish each day for at least a fortnight before coming full circle again. Pork and mushroom ball soup, known as Bun Moc, would have to be a highlight. It’s a porky broth with a medley of pork cuts simmering away with varying tastes and textures – Cha Lua (a processed pork “loaf”, like pork devon), delicate soft pork and mushroom meatballs, plus a piece of tender pork rib all go into making this simple-looking and super comforting noodle soup dish. The broth should be clearish and usually comes with a fermented fish paste as an optional seasoning (this should be used with caution). 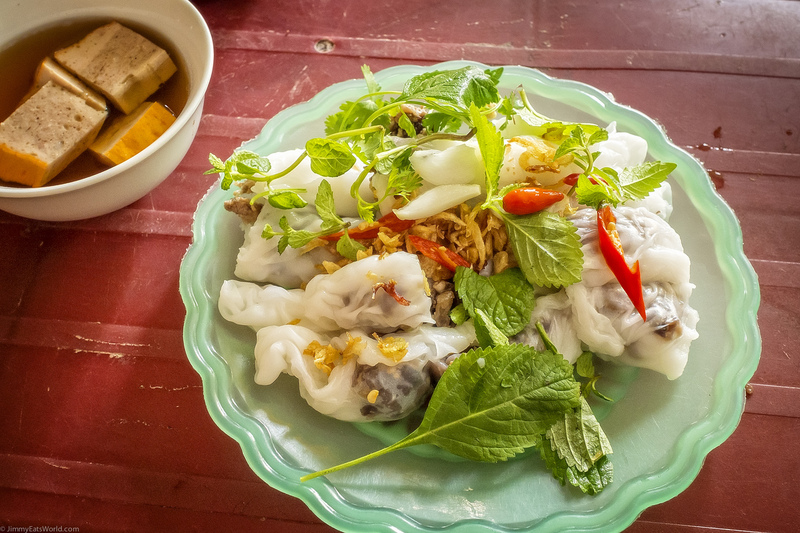 Not many people who visit Saigon know about it, but just try saying no once you’ve tried it. Forget about stodgy wheat pastry spring rolls that are filled with frozen chopped vegetables – these bad boys are the Rolls Royce of spring rolls. Stuffed mainly with crab meat and glass noodles, these plump and juicy babies will leave you wondering how we got it so wrong back home. When night falls, there’s nothing better than sitting on a small plastic stool at a street side seafood restaurant and handpicking shellfish to be cooked to your liking. There are usually at least five different types of shellfish, snails and crabs to choose from, but the best ones are the clams (or pippies as we know them in Oz). You can order them stir fried, grilled or cooked in a satay sauce but they’re so flavourful that simply steaming them in their own juices with a handful of lemongrass thrown in will do the trick. The flesh is plump and tender but the lemongrass-infused broth is what takes it to the next level. Use the shells to scoop up a teaspoons worth of broth along with the clam meat and enjoy it with a large bottle of Beer Saigon. These rice flour rolls are the “all rounder” of street foods. You can have this dish for breakfast, lunch or dinner. It’s light and simple but still packed with flavour. A fermented rice flour batter is thinly spread onto a steamer and covered with a huge stainless steel cone shaped lid as it’s steaming. These metal cones are easily spotted from the road so you’ll know where you can try it. They usually come filled with ground pork and mushrooms and are folded like a loose spring roll. Served with a dipping sauce, steamed bean sprouts and some cha lua, it’s one of the freshest and most versatile dishes you’ll ever eat. Sample Vietnam’s flavours. Head there with Qantas.